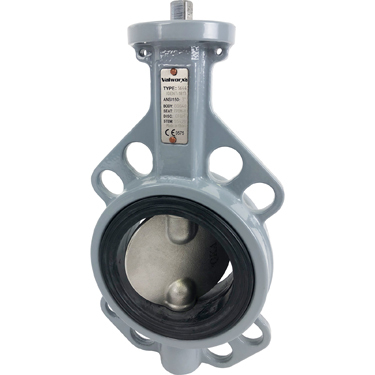 Soft seated Wafer butterfly valve for on-off control of water and other media compatible with the materials of construction. Wafer style valve sandwich mounts between customer supplied ANSI /ASME Class 150 and other international standard flanges. Unique wave line seat and disc shape, reduces the required torque and extends the life of the valve. The disc seat is vulcanized to a phenolic back-up ring guaranteeing positive control of seating torque while eliminating seat distortion. Precision machined 316SS disc with two-piece stem (shaft) construction, enhances the flow capacity of the valve and reduces turbulence. Stem utilizes PTFE/graphite bearings with V-type ring seals preventing leakage. 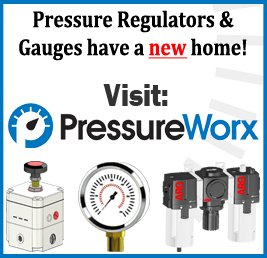 Standard ISO5211 top mounting allows for easy air actuator, electric actuator or manual handle installation. Ductile iron body has a special 3-layer coating Epoxy/Epoxy/PUR for excellent weather and corrosion protection. This valve is a bare stem direct mount design, order optional hand lever or actuators separate.